This is a site dedicated to educators and covers topics related to teaching, technology and notebooking in the elementary classroom. 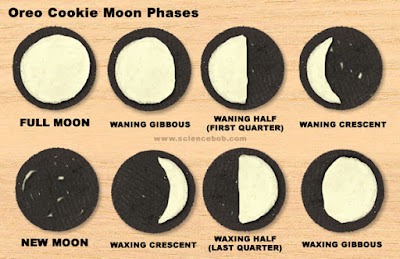 I've seen these cookie moon phases before (click here for a description of the activity on Science Bob's Blog) and wanted to share my "Moon Phase" cookie story. After seeing these online I thought it would be fun to do it in class as part of our Astronomy unit. I decided to make these at home. They turned out adorable. Then I decided to eat them (justifying that I would let my kids eat them in class :) It quickly became apparent that 8 Oreo cookies was way too many to eat (I definitely felt queasy). I went back to the online directions and found out that I was suppose to use "mini Oreo cookies" (which made much more sense). A note of caution, the mini Oreo cookies may not be as cost effective with large groups of children (when I taught middle school I had 80+ children). It is definitely cheaper to buy the generic chocolate sandwich cookies. I would just provide a snack or sandwich baggie so the kids could take the leftovers home. What a fun and yummy idea!!! I have done this activity for many years with second grade. It is one of my favorite ways to reinforce moon phases after teaching it. I too felt that the mini Oreos were the way to go. Always had enoughbleft overs for an aftervschool snack. This is a great idea, however the first and third quarter moons are mislabeled. The waxing "half" moon is the first quarter moon. The waning "half" moon is the third or last quarter moon. I started this blog many years ago as a classroom science teacher with the express purpose of sharing notebooking ideas with other educators. I have since moved into a technology coach position within our district so this site has morphed into a general teaching blog. Basically anything that I see or do in schools that I think is pretty cool gets highlighted here. If you are visiting to find notebooking information please look at my earlier posts. I have tried to label all my posts so information is easier to find...so, when in doubt look at the labels. As always, if you have any question please feel free to email me and I will do my best to help! Baby Evelyn at 3 Months!